This is a hidden opportunity for an offshore sailor. 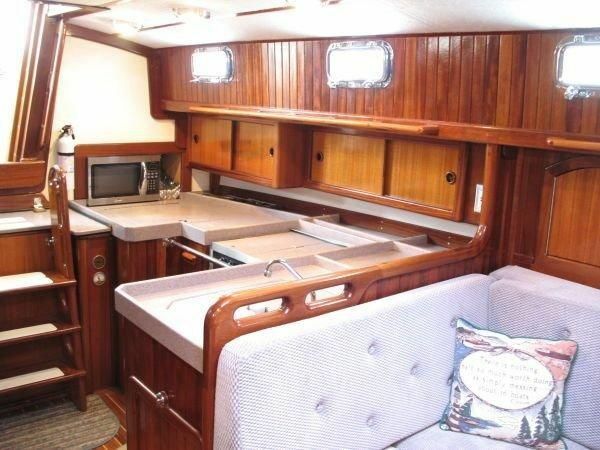 A 2002 offshore boat with a gorgeous interior, for just an ask price of $ 89,000. What a Boat! What a price! How about a New Pacific Seacraft 40 in your life? How strong can a cruising boat be? Old Pacific Seacraft phone and address, do not use, for informational purposes only. Historical ad for a Pacific Seacraft (Crealock) 37. Launch your boat like a pro, a sober pro that is! Come and join in the fun! When Saturday, July 30, 2016. Paddle Boarding, Fresh Pizza, Good Times, Brokerage Boats Open, Sailing, Kayaking, Liferaft Demo, Fun and Swimsuits. Were you aware that Pacific Seacraft built and sold a new South Sea 61? You want hull #2? Call Seacraft Yacht Sales and we will arrange it! We had a great time at Seacraft's Waterfest 2015. Looking forward to next year. Check out the life raft demo.